Despite the fact that presently, virtual players are presented with a great as many banking solutions, only a few of them are as favored as Skrill. This comes hardly as a surprise due to the fact that payments via it are wrapped up in a prompt and a hassle-free manner, which is momentous as long as you are making real-money bets over the Internet. Skrill is undoubtedly one of the payment solutions the bulk of the gambling enthusiasts are familiar with as a constantly-growing number of casino operators get to facilitate payments through it. Interestingly, Skrill was initially known as Moneybookers, and it saw the light of the day back in 2001. Since that moment, a prime concern of the company has been to provide its customers with a payment service which allows them to purchase goods over the Internet, to send and to receive money, and last but not least, to conduct payments to the virtual casino they have joined. The company is based in London, but it also has offices in the United States of America and in various European countries. An interesting detail is the fact that in 2002, the company became the very first European e-money issuer which is regulated by FCA. Thus, Skrill has gradually grown to become one of the most trusted providers of payment services which is available in nearly 200 countries, and which supports more than 40 currencies. As long as you have not made use of Skrill before, in the first place, you should know that this is an e-wallet, which means that your funds will be stored there for further transactions which will be executed over the Internet. It is important to note, however, that if you wish to take advantage of the payment service, first, you need to set up an account, which will not occupy much of your time. While establishing their account, gambling enthusiasts will be asked to input a valid email address, a password, as well as their name. Once you have set up an account and you have carried out a certain volume of transactions, you will be prompted to verify your account. Gambling enthusiasts should bear in mind that the company has lately changed the procedure they should follow in order to verify their account at Skrill, but there is nothing to fret over. Avid casino fans who have not verified their account yet should consider doing so due to the fact that thus, they will be able to carry out transactions of larger amounts of money. Best of all, you might also have your account limits removed, which is an opportunity higher-stakes players might be interested in. In order to complete the verification procedure, gamblers should provide a scanned copy of their driving license, ID card, or a copy of a utility bill which has been issued within the past three months. Virtual players are advised to make sure that the images they provide are clear as this will dramatically cut down the processing time. Once you have done this, you can easily check if your account is already verified simply by visiting its settings where you will find the Limits and Verification section. After your Skrill account is all set up, the next step is to load it with cash. What further adds to the merits of the digital wallet is that gambling aficionados will have the opportunity to upload funds into it in several convenient and simple manners. Gamblers who have decided to give Skrill a go are enabled to top up their account via a bevy of local and global payment methods such as bank transfers, cards by American Express, Visa, Mastercard, Diners Club International, the prepaid Paysafecard, as well as via Trustly, Klarna, Neteller, Boku, Bitcoin, and many more. Still, virtual players should be informed that a fee which stands at 1% will be applied, irrespective of the payment service they have decided to choose and pick, which undoubtedly makes Skrill an outstanding banking method also because of its cost-effectiveness. When all is said and done, gamblers can proceed with making a deposit to the web-based casino they have signed up for an account. Perhaps, one of the best things about using Skrill for gambling purposes remains the fact that making transactions from and to your virtual casino of choice is made a breeze. When you wish to embark on your gambling adventure, first, you should sign into your account at the web-based casino which facilitates payments via Skrill. It is true to say that you are highly unlikely to be hard up when it comes to the proper virtual casinos that support payments via the digital wallet as in practice, they are aplenty. Once you have signed into your account, you should not feel at a loss as you just need to visit the cashier where all the supported banking solutions are incorporated. Afterward, gambling aficionados simply need to go through the list and to pick Skrill as their preferred payment service. Following this, they will be asked to provide the email address they have utilized while setting up their Skrill account and to enter the amount they would like to upload. Once you are done with this, you will be prompted to log into your Skrill account using the credentials you have. Then, you just need to confirm the payment, and your funds will be added to the balance of your casino account in a matter of a few minutes. Another great perk of using Skrill for gambling purposes remains that on the whole, casino operators do not charge any additional fees when managing your funds via Skrill. What is even better about Skrill is that the digital wallet can also be utilized when you have enjoyed bountiful results, and you wish to cash out the winnings you have built up. Best of all, the procedure you should go through while retrieving your funds does not differ from the one you followed when making a deposit, meaning that you are highly unlikely to end up bewildered what you should do. It is also important to note that some casino operators give their patrons the chance to reverse withdrawals initiated via Skrill, but this is casino-specific. When it comes to the most popular banking solutions among virtual players, there is no doubt that Skrill is invariably on the list. In essence, there is quite a simple explanation for this as the digital wallet ticks a lot of the boxes gambling aficionados have. Perhaps, one of the most compelling reasons why Skrill is so incredibly popular among gambling enthusiasts remains that the payment service is almost universally accepted. Interestingly enough, the lion’s share of the web-based casinos has incorporated it in the list of the supported banking solutions, thus giving you the chance to find the operator that best suits your taste. Besides, Skrill facilitates payments in more than 20 currencies and supplies its services in over 200 countries around the globe, which is yet another great advantage. The speed at which transactions via Skrill are carried out is yet another reason why all the more gambling devotees decide to employ the e-wallet during their betting session. One of the biggest benefits of utilizing Skrill while conducting payments remains that you can access your funds almost immediately after you have wrapped up the transaction. As for withdrawals, they might not be instantaneous, but they are considerably faster when compared to other payment solutions. The next advantage of the payment method has to do with the security levels it boasts. Many virtual players might be delighted when they find out that the company puts great stress on the security of its customers. That is why it has implemented an encryption technology which is compliant with the requirements of the Payment Card Industry Data Security Standards. Other than that, the two-factor authentication further strengthens the security levels. When making payments via Skrill, in practice, your banking or personal information will never be revealed due to the fact that all you need to make a transaction is your email address and your password. As a result, virtual players can easily retain their anonymity while making real-money bets over the Internet. Flexibility is yet another of the positive sides Skrill has as gambling aficionados are enabled to conduct payments via the digital wallet through their personal computer, tablet, and smartphone. Perhaps, you have already figured out that making payments from and to your virtual casino of choice via Skrill is extremely simple, which makes the payment service even more appealing. Despite the fact that using Skrill for gambling purposes has so many great benefits, the payment service also has several downsides which should be considered as well. As long as you take closer scrutiny, you will find out that there is a somewhat large number of complaints that the verification stalls. What makes the matters even worse is that the customer support department also fails to help gambling enthusiasts deal with this. While being on the subject of customer care, there are also many complaints that the agents fail to provide assistance in a prompt manner. As it turns out, this further adds to the frustration of virtual players. Some gambling enthusiasts are also not satisfied that quite often their Skrill accounts are being blocked, thus ending up with trapped funds. This might pose a serious problem as your account may remain frozen for quite some time, thus making your funds temporarily inaccessible. Another of the downsides of Skrill has to do with its availability. Even though the company provides its services in such a broad variety of countries, gambling enthusiasts from territories such as the United States of America cannot take advantage of the payment method. And last but not least, we should not forget to mention the fact that many casino operators will not allow virtual players to make use of certain bonuses and promotions as long as they have managed their funds via Skrill. The explanation for this is quite simple as casino operators just aim at averting any fraudulent activities. While making up your mind which way of payment best suits your needs and preferences as a gambler, the fees which might occur should invariably be taken into account. Normally, casino operators do not burden their patrons with any additional fees when they are topping up their account or withdrawing their funds. 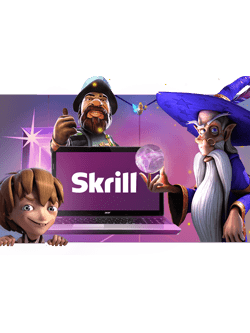 Still, gambling devotees should be aware of the fact that certain fees might be applied on the part of Skrill itself which is the reason why checking this in advance is always a good idea. Avid casino players should bear in mind that utilizing their digital wallet to purchase goods over the Internet, will not cost them a dime. The same refers to receiving money into your account. Still, as long as you are intent on sending money to another Skrill account or to an email address, you should be informed that this will cost you 1.45% of the amount. Other than that, gambling enthusiasts should not forget that while they are uploading funds into their account, a fee of 1% will be taken away from the amount. Luckily, withdrawing your winnings back to your Skrill account is made cost-free. The picture changes when you are determined to retrieve your funds from your Skrill account due to the fact that the fees will mount. Gamblers who wish to retrieve their funds back to their bank account need to know that this will cost them $5.5. Withdrawing your funds back to your Visa card will cost you 7.5% of the amount. In the event that you wish to withdraw your funds back to SWIFT, once again, you will be compelled to pay a fee of $5.5. Gambling enthusiasts should be informed that if the transaction requires currency conversion, a fee of 3.99% will be added. Players should also know that they will not be constrained to pay any fees while using the service, provided that they make payments or log into their account every 12 months. Otherwise, a fee of $6 or the currency equivalent will be taken away from your balance. Now, you are already familiar that payments via Skrill are carried out in a prompt and a secure manner. The speed at which transactions via the e-wallet are conducted may definitely work to the advantage of gamblers decide in favor of the banking solution. Gambling devotees will undoubtedly appreciate the fact that their funds will appear in the balance of their account in a matter of a few seconds as thus, they will have the opportunity to start playing without a delay. By the same token, Skrill is also a viable option for withdrawals as the timeframes within which you will receive your funds are not that prolonged when compared to the processing times of some of the other providers of banking solutions. As a general rule, gambling enthusiasts might need to wait between 3 to 5 working days in order to lay their hands on the winnings they have collected. As you can see, Skrill turns out to be not only a reliable but also a cost-effective and a prompt banking solution which explains why it is considered such a great option for gambling enthusiasts. Currently, still the more players seek to register with casino operators which boast fully mobile-compatible websites, with the most obvious reason being that they wish to have the freedom to gamble when being out and about. Thus, as long as the interactive casino you have signed up for an account offers a mobile version, you will have the opportunity to carry out transactions right at your fingerprints simply by navigating to the cashier page of the operator. Perhaps, one of the best things about Skrill remains that the company gives its customers the chance to execute payments over the Internet in a fast and a secure manner thanks to the dedicated apps it trots out. Skrill users might be delighted to find out that they are presented with dedicated apps for iOS and Android-based devices which can be downloaded at no cost. 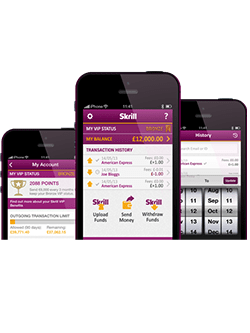 One of the biggest positives of these apps remains that they give gambling enthusiasts the chance to access their Skrill account whenever they need to do so and to keep track of their funds without trouble. The apps allow players to keep an eye on their current balance, to deposit, and to withdraw with only a few taps on their screen. Having in mind the fact that such a large number of dependable virtual casinos facilitate payments via Skrill, gambling enthusiasts are highly unlikely to end up in a sticky wicket while searching for a decent casino operator. Furthermore, Skrill boasts secure transfer of funds, meaning that gamblers should not be anxious about making deposits and withdrawals using the digital wallet. In the first place, your security is ensured due to the fact that making payments via Skrill does not involve disclosing any of your personal or banking information. As stated above, virtual players simply need to log into their account using their email and password. Avid casino fans who have picked Skrill should also be aware that the company will not reveal any of their sensitive information to the casino operator. In fact, the information they transmit is encrypted using a sophisticated technology which serves as a proof that even if you become a victim of misappropriation or fraud, your details will be unreadable. Gambling enthusiasts are also enabled to add an extra layer of security thanks to the two-factor authentication the company has introduced. This option is available to all customers who have signed up for a Skrill account, and its main aim is to guarantee that your funds are heavily guarded. Thus, as long as you decide to make use of this opportunity, each time when you make a payment via the digital wallet, you will get a unique code which you will be prompted to enter along with your account credentials. Since Skrill is dedicated to keeping its customers safe while they are making payments over the Internet, it is no surprise that they need to go through a verification procedure in order to make use of the digital wallet. Thus, gamblers will be sure that their details will remain heavily protected, but they will also be given access to the full set of features Skrill boasts. How to verify my account and to increase my limits? Gamblers should know that once they have started making use of the service, they need to provide an identity proof. They need to provide a scanned copy of their driving license, ID card, or a photo page of their passport. How long does it take to receive money via Skrill? Typically, receiving money via Skrill is instantaneous, and gamblers are not required to pay additional fees. Still, they should check this in advance due to the fact that on its behalf, the operator might apply some charges. Virtual players are allowed to load their Skrill account via bank transfers, but they should keep in mind that such transactions might take from 2 to 5 working days. It is important to note, however, that the bank transfer should come from an account which is held in your name. Funding your Skrill account via credit and debit cards is also a viable option. Yes, virtual players are given the opportunity to make payments in more than 40 currencies. Still, they should bear in mind that a currency conversion fee will be applied. How long do deposits via Skrill take? As long as the transaction is properly executed, your funds should appear in the balance of your account in a few minutes after you have wrapped it up. Still, virtual players should keep in mind that the company may cancel their transaction as long as they identify a problem with the payment.